Tulsi, also known as Holy Basil, has been used for medical purpose for centuries to treat a variety of diseases. The scientific name of Tulsi is “Ocimum Sanctum” that Indians considers as the most sacred of all the herbs found in India. 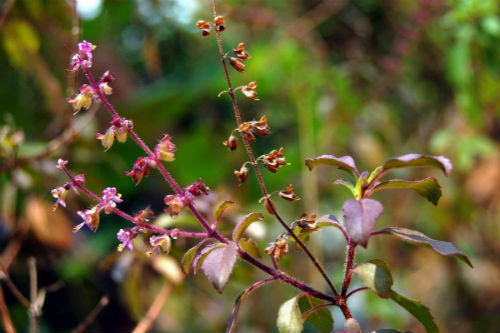 This Holy Basil is very common in almost every Indian house hold. It is believed that even going close to a Tulsi plant alone can cleanse your body and mind. Tulsi has many medical values that we are not aware about. This herb is a good medicine for common cold, headache, insect bites, itchiness. It works as an appetizer and promotes digestion by helping in secretion of digestive enzymes. You can see a variety of Tulsi plants, but the more medicinal value is for the Holy Basil which have light purple with green color leaf and stem. Tulsi is an essential ingredient in the preparation of Ayurvedic cough syrups. The juice extracted from Tulsi leaves is commonly used to cure cold and flu. Making coffee with dried ginger, pepper and a few Tulsi leaves is a traditional Indian medicine for fever. Water boiled with Tulsi leaves can be taken as a drink in case of sore throat. Even you can gargle with this decoction for quick relief from sore throat. This Holy Basil leaves can strengthen stomach and help in respiratory diseases. Antitussive contain in Tulsi can suppress and reduce the amount of cough. The anti-bacterial and anti-fungal properties of this leaf can beat the respiratory infections. The decoction prepared by mixing honey, ginger and Tulsi leaves is quite helpful in combating bronchitis, influenza and asthma. This herb is good for curing common eye problems. Sock a few Tulsi leaves in pure water, leave it for whole night and wash your eyes with this water in the morning is a good treatment for curing many problems of the eyes which are caused due to viral, bacterial or fungal infections. Regular consumption of this Tulsi water can protect your eyes from infections and keep your eyes and face skin healthy. Stress is a common problem among young and old. Recent studies have shown that Tulsi leaves are rich with the anti stress agents, which helps to smoothen nerves, regulates blood circulation beats free radicals that are produced during stress. Even healthy persons can have 12 leaves of Tulsi, twice a day, to prevent stress. The powerful anti oxidant compound called eugenol, which is rich in Tulsi leaves, helps to protect heart by keeping one’s blood pressure under control and lowering cholesterol levels. Chewing a few leaves of raw Tulsi on an empty stomach every day can both prevent and protect any heart problems. Tulsi keeps your skin and hair healthy and glowing. The magic oil, the combination of coconut oil and Tulsi leaves, is good for healthy long hair. The amazing power of Tulsi can purify your blood and the anti-bacterial and anti-fungal properties can protect your skin and body. Regularly taking a mixture of basil leaves juice with honey for six months is a good medicine to dissolve kidney stones. Tulsi also helps to maintain insulin level in the body and it is a natural cure for diabetes. When you feel ill try to have a few Tulsi leaves and feel the difference. Dropping a few leaves in drinking water is good as it smells good, purifies your body and stomach and kills germs. Keep Tulsi planted indoors and protect the whole family from mouth infections, coughs and cold. Next articleHomosexuality – A Lifestyle Choice or rather a Predetermined One?